Apologies for the headline. Hardly original. I'm guessing you'll see it more than once over the next 24 hours. OK, so I called it wrong on my prediction post (not, thankfully, in the bookies). I'll do a video printer on that. It's Celtic 0 (nil) v Ross County 2 (two). The biggest result in the Scottish Cup's history? The worst result in Celtic's history? They're big claims and it's too early to make them. But, dearie me, it's an absolute stunner of a result. A fitting end for Celtic's season. The end of any hopes Neil Lennon had of taking over permanently. Can they raise themselves to secure second? And the signal for yet more soul searching at Celtic Park. Time for the board to fall on their swords? Questions for later. Today, in the match, Celtic were beaten by a better side. So we should be celebrating Ross County's achievement. Which is huge, absolutely huge. A cup final. Knocking leading SPL teams out on the way. Magnificent. Celtic were bad. But Ross County were better than them by quite a distance. Corners, attempts, territory. Celtic were dominated by the First Division side. County got everything they deserved. So, in a completely different way, did Celtic. Yes, they have a chance (and they will still be patronised by Sky Sports). Will they win? I think probably not. Do I hope they win? Absolutely. Celtic in the final is boring, a reward for a season of mismanagement that they don't deserve. Nobody is patronising County now. Not that I want to hijack Ross County's win. But. Is this not quite an argument for both the pyramid system and a larger SPL. I think it might just be. "Two things you can't give them is hunger and desire. And this team is really lacking in that department. You can see today why Tony lost his job, we've gone out of every competition with a whimper." "Some of them [players] don't deserve to be here. They went out and took game for granted. We were living in hope at half time. "Major surgery, major surgery. Nowhere near good enough for Celtic. "You've got to call it as you see it. Totally unacceptable. Last chance of silverware, went out with a whimper. That's an indictement on me." Biggest shock was how much County deserved to win it. Feel for Neil Lennon but unfortunately this will become all about Celtic, it should be all about Ross County." "Neil's players should be hurting more than him but they won't be. He'll be feeling it more than anyone." There's an SPL game on four of the next five days. Monsieur, with this succession of dull football matches, you're really spoiling us. I have an issue with the scheduling actually. Would it not offer a smidgeon of excitement (however manufactured) if Hearts and St Johnstone were kicking off at the same time this weekend? As part of my rant free weekend I'll say no more. A mouthwatering prospect as two of the league's form sides clash. Is how I would start a preview of this game if I lived in a parallel universe. Sadly I'm stuck here without a Tardis. It's never difficult to find a pessimistic Hibs fan but when Hamilton won this match early on in the season I heard a few people voice their concern that John Hughes' shiny, new Hibs were not quite worthy of the plaudits they were receiving. The voices of doom are probably saying "told you so" and sitting back smugly now. The Accies have an eight point cushion from the bottom now but will hardly be hanging up the bunting and celebrating survival just yet. Especially if they lose today. Away win. A top six place could be at stake if Hearts lose this one. Kilmarnock have stumbled back towards the abyss and sit only four points above Falkirk. Much to play for at Tynecastle then. But, really, does anyone expect this to be a classic? A pragmatic draw. If Hearts lose to Kilmarnock this game will offer St Johnstone a shot at the top six. If Hearts win or draw then this game will be a pretty pointless affair. Them's the breaks. I fancy St Johnstone though. Away win. A big game as Neil Lennon's Celtic continue their attempt to hunt down Rangers (ha, ha, ha). Motherwell have slipped out of the race for third but are still very much in the hunt for fourth. We'll know by Sunday night if simply cementing their position in fifth is enough to get into Europe (I suspect it will). Celtic are, of course, closer to third than first so they still need to win games. I think Motherwell will get a draw though. Rangers edge ever closer to the title in a league they have totally dominated. United have given them as much as trouble as anyone else and there is, at least before Sunday's semi final, a confidence at Tannadice that is unusual for any of the non Old Firm sides. This could be a rather tasty affair. And I'm backing a home win. So there. Where we stand: I am now willing to concede that this SPL prediction tracking experiment that seemed like a good idea in August has actually left me looking a tad foolish. 59 out of 141 is the stuff of nightmares. A success ratio that is some 10% worse than Tony Mowbray's at Celtic. I may not continue with this next season. The romance of the Scottish Cup. Ross County battle to their first semi final and are rewarded with that most traditional of kick off times. Yes, it's the much coveted 12.15 kick off at Hampden. Not going to say anymore, a rant free weekend will help my equilibrium. Maybe I should try meditation. Or at least medication. So County, the Staggies, the marauding clansmen, the brave highlanders, the plucky minnows, the pride of Dingwall. Today is their day in the sun. Have they got any chance? Or will they simply have to make do with being patronised by Sky Sports for a couple of hours? Celtic are still beatable. The cult of Neil Lennon may be growing but, in truth, he's not working miracles, hasn't given evidence of his genius. Celtic fans should probably be wary of giving him to much acclaim at this stage. It lets the board off the hook, allows them to go for the cheapest option. And what are Celtic left with? Another former player with absolutely no experience of managing a club of their size. Sound familiar? A cup win of course would give Lennon instant karma and leave Tony Mowbray a jealous guy. Imagine. I think Celtic will win today but I'll be disappointed if County don't give them a game. In the Sabbath semi final Raith Rovers face Dundee United. I'd like to say I tipped United for the cup at the start of the season but that would be a lie. I'm sort of tipping them now though. Right now United seem to have the kind of momentum that David Cameron would sell his granny for. Well, maybe not his granny. But definitely your granny or my granny. Or all non Bullingdon grannies. United then to win by a comfortable margin. Anyway it was the turn of Gregory himself, John Gordon Sinclair, to host as the shortlist for the goalkeepers and managers was revealed. Incidentally if you want to catch up with what JGS is doing these days can I point you in the direction of BBC Radio Scotland's comedy No Hard Feelings on the iPlayer. I stumbled across it today and can honestly say it's the best way I've found this year of depressing yourself if you're worried about being a bit too happy. If a country gets the national radio station deserves then there are times when Radio Scotland confirms Jock Tamson's bairns as a collection of brain dead zombies. Right, state of the Scottish media rant over. The goalkeepers chosen were Alan Rough, Jim Leighton, Andy Goram and Craig Gordon. As I predicted that list makes uncomfortable reading for Hibs fans. In the 1980's and into the 1990's you could look at Easter Road and find a player involved in the Scotland squad between the sticks. Now you can find a succession of clowns buttering their gloves. Funny how things work out. I am an Olympian bore when it comes to Rough, much maligned and much undervalued. 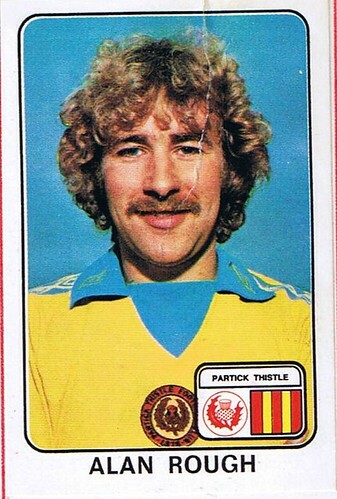 Years of sterling service at Partick and Hibs were underpinned by a long and generally reliable Scotland career. Remember it was Rough who coped with the pressure of coming on against Wales in that fateful 1985 qualifier and that's always struck me as a far better indication of his ability, attitude to the game and reliability than our miserable Argentinian summer. Goram and Leighton were different from each other but both outstanding. And Gordon is the only current player to make any of the shortlists which speaks volumes for his ability and the reliance we now have on his heroics. The manager's list sees Willie Ormond and Jock Stein battling it out with Alex Ferguson and Walter Smith. This kind of makes a mockery of "Scotland's" Greatest Team. Ferguson managed Scotland for 10 games following the death of Stein, including a World Cup campaign that saw us score one goal. Smith didn't even get to a major tournament. Great managers, great records - and Smith did well with Scotland - but not great Scotland managers. Andy Roxburgh and Craig Brown, and I'd be the last to call them inspirational choices, both qualified for tournaments. That's got to be the critical judgement in the consideration of a national manager. So not too happy with that and when I make choices before next week's final programme I'll not be picking Alex or Walter. I'll post my final 11 and manager, based on the shortlist, next week. Far be it for me, at this time of national debate, to draw your attention to a newspaper sometimes referred to as the Torygraph. But I'll make an exception for Roddy Forsyth's quirky take on Sunday's match at Easter Road. The redevelopment of the East Stand has thrown up a whole new viewing experience in Leith. Once upon a time the vista from the upper reaches of the West Stand at Easter Road was of ships plying peacefully up and down the Firth of Forth in the distance. However, the demolition of the East Stand has opened a whole new world of wonder for spectators on the opposite side of the ground – and for many equally fortunate denizens of the adjacent stands. The flats between Hawkhill Avenue and Lochend Park are now in full view and provided a wealth of alternative entertainment to Sunday's televised game between Hibs and Celtic. The following summary gives some idea of the action. I promise this will be the last post on the depressing inadequacies of the game's administrators for a long time. Well, a day or two at least. But today's Herald investigation into youth football in Scotland is an interesting if predictably unsettling read. It centres on the failings of the SFA's youth intiative and the conflict it has caused with boys' club football. A typical story of the SFA thinking "we can do this" and failing to recognise that their most useful role might be working alongside and supporting the mechanisms that were already in place. But then dictatorships tend not to do partnership working. It didn't work out too well for Hitler and Stalin after all. There is also the more serious issue of the initiative's use of public money. A petition, about to be discussed at Holyrood, is calling for the SFA to provide a comprehensive audit trail of where they've spent the £12.3 million of taxpayer's cash they've received in the last three years. There's no evidence of anything more sinister than a misdirected scheme but the idea of Gordon Smith having to explain all this to a parliamentary committee should be a major source of embarrassment for the SFA. What angers me most is not so much that the scheme appears to be failing in its ultimate aim of improving the game. That was predictable. Worse than that the power it gives senior clubs and the way it treats the kids is actually robbing children of the chance to enjoy the game. "Taking The Fun Out Of Football" is an unusual slogan for a national association to adopt. Take a peek at www.realgrassroots.co.uk to find out more about how traditional boys' clubs are responding to what they consider to be the threat of the SFA's scheme. The Scottish Football Association has drafted a plan for an independent, three-strong panel to examine appeals against disciplinary decisions. It present, match officials decide whether an appeal can proceed. Hearts' Jim Jefferies, St Mirren's Gus MacPherson and Hibernian's John Hughes are backing the proposed change. Scottish football is crap, Scottish football is run by a cabal of incompetent plonkers, Scottish football is crippled by vested interests, Scottish football is dying. I'd like to think I give the blog a little more flesh than that, even that I sometimes manage to entertain and encourage, if not a chortle, a little smile. But I am aware that a lot of my posts do revolve around those central themes. Well, maybe now is the time to be a little more constructive. A conversation with Left Back In The Changing Room's Rob on Twitter brought up the idea of a Blogger's Manifesto. The idea came from the continued non delivery of the McLeish Report and the belief that if the SFA wanted that to be a truly radical evaluation of the state of the game they would probably not have asked Henry McLeish to compile it. More Than Mind Games and Left Back In The Changing Room have already posted asking for fellow bloggers to get in touch with ideas and suggestions and I'm happy to extend the same invitation. You can contact me on Twitter, leave a comment on this post or contact me using the links on this page. Already today I've had conversations or read articles about artificial pitches, summer football, youth football and expanding the SPL. This year we've seen debate on a restructuring of the lower leagues, the introduction of a pyramid system and a hundred other ideas to get Scottish football moving again. This is your chance to have your say. This is an idea in its early stages but the more people that come on board the more chance we have doing something worthwhile, the more people involved the greater the likelihood of producing a real (and I fear much needed) alternative to McLeish. So, for now, it's over to you. That's those of us with the temerity to talk about football on this strange internet thingy. Or at least that seems to be the argument Louise Taylor is making on The Guardian blog. While the internet remains a wonderful invention, football supporters and the web are an increasingly noxious mix. With stewards and police no longer turning persistently deaf ears to racist or homophobic abuse inside grounds, a warped, and militantly vociferous, minority have moved from shouting venom to typing toxic thoughts before pressing Send. Clearly in the upper reaches of the Championship where Louise Taylor spends her time the stewarding is somewhat more proactive than in Scotland. I also love the "while the internet remains a wonderful invention" line. She may have written this in 1996. Others, meanwhile, simply prefer making hi-tech mischief. There have been two notable recent examples of such trends. At Newcastle United the alleged altercation between Andy Carroll and Steven Taylor, which left Taylor nursing a doubly broken jaw and feeding through a straw, prompted a surfeit of septic, completely unfounded, rumours on some Newcastle supporters' sites. If Newcastle's enduring, ill-advised, silence on the Taylor-Carroll affair is a pollutant at the heart of an otherwise renascent club, Aston Villa were dumbfounded last week when fans' forums began buzzing with chatter concerning Martin O'Neill's supposedly imminent departure in the wake of Villa's 7-1 thrashing by Chelsea. All it took was a post beginning: "I don't know if this is true but ..." on VillaTalk for the rumour to develop "legs" long enough to ensure its replication on national radio stations and newspaper websites. In fact the only reason I know that Taylor is "feeding through a straw" is because Louise Taylor has dropped that little nugget into almost everything she's written since the fists started flying. If two highly paid players decide to have a fight over a text message then rumours will fly, internet or not. And what new levels of cyber-hooliganism do we reach when somebody starts a forum post with the words: "I don't know if this is true?" That this was picked up and run as fact says more about the failings of the old media than the dastardly nature of this strange new breed of internet users. There are total and utter arseholes posting on the internet about football. Nasty, petty, ill informed. You'll also still find them in football grounds up and down the country. Take a look at the Daily Mail comments section though. If we're talking homophobes and racists then Richard Littlejohn probably has a bigger case to answer than people trying to provide an internet presence for people who love football and want to share a love of their club. And just like I don't need to share a pint with these people after the game, I don't need to get drawn into their fetid little corners of the internet. They make a choice to be idiots. I make a choice to ignore them. That's life. There is an unfairness inherent in seeing people ridiculed and their reputations trashed by anonymous, factually challenged, half-wits who would probably never dare say "boo" to the object of their vitriol's face. Even worse, the suspicion is that witch-hunts are sometimes manufactured by the same numbskull submitting multiple comments via different usernames. Is Louise Taylor now so far removed from the experience of the "ordinary" fan that she thinks people don't act like this at games? The internet is only reflecting the same cross section of supporters - good, bad, ugly, ignorant - that fill our stadiums every week. On the other hand the internet can be a force for good. It's easier for fans to form a collective voice. Would the anti-Glazers campaign at Old Trafford have gathered such pace and visibility if information had to be disseminated by traditional fanzines or a local press frozen by fear and awe in the face of the omnipotent Alex Ferguson? My own experience? I didn't start this blog to engage in cyber hooliganism (and is name calling and gossip mongering really on a par with hooliganism?) and although I will take a pop at people I try and do it with an amount of humour and only because I do care deeply about the game. And, touch wood, I don't seem to attract comments from the dark forces of which she speaks. My experience of other Scottish football blogs is much the same and, although there are forums I would probably choose not to go, most share the same mix of fans that you would find "behind the goals." I am certainly unable to recognise any of Taylor's overwhelmingly negative stereotyping in my travels around Scottish football online. Ms Taylor concludes by calling for the FA to start an "Online Respect" campaign starring Beckham (chants about his wife were probably only ever heard on internet forums), Rooney and Capello. I think, given the success of their "Offline Respect" campaign, that she's just slipped that in as a joke. Still, it's nice that The Guardian have provided her with an internet platform on which to rant ignorantly about internet platforms. For info: Given the subject matter dealt with above a little note on comments to this site. Basically there is no policy as such. Anything that I felt was bigoted, racist etc would not be published and obviously spam gets deleted. Other than that I'm quite easy going and happy to simply publish whatever you write. The only personal abuse I've received was on Twitter when a Rangers fan called me a "prick" minutes after they won the League Cup last month. According to Louise Taylor he was probably bang on the money. Time for the traditionalists to build up their reactionary barricades to try and halt the march of progress. Yes, the artificial pitch debate is back. The SPL are said to be "open" to the possibility following the dire weather over the winter. In part this is just the typical over-reaction we always get when a bit of snow falls. I'm quite easy about this though. The fourth generation pitches are a world apart from Luton's 1980's astroturf or even Dunfermline's plastic pitch of a few seasons ago. I was there when Hibs played at East End at the grand unveiling of the pitch and winced with everyone else when an exuberant Hibs fans decided to finish an inappropriate streak with a full body slide in front of the away end. Agonising. But things have moved on. CSKA Moscow entertained Inter Milan on their artificial turf on Tuesday evening. That was Champion's League quarter final not a mid table clash between Hamilton and St Mirren. It's hard to look at some of the artificial pitches available now and not wonder why we are still subjected to pitches like Fir Park. There must be an argument that playing on a surface where the ball could actually move freely along the ground would improve our game. Money in it for the clubs too. The initial outlay would be offset by lower maintenance costs and the ability to use the pitches all the time, both for training and as a source of revenue. I'm sounding like an artificial pitch evangelical. I'm not particularly. But if it means improving the quality of the game then we should at least be moving the debate forward. Much talk of 1999 and all that in Peter Drury's typically myopic and hysterical commentary on Bayern Munich's win over Manchester United last night. Speaking of which this is only the second year since 1999 when the four semi finalists have been drawn from four different countries. Back in 1998/99 the teams were United and Bayern playing Juventus and Dynamo Kiev. In 2003/04 Monaco beat Chelsea and Porto knocked out Deportivo la Coruna. That Porto v Monaco final was the first time since 1990/91 that neither finalist came from Spain, Italy, England or Germany. Unfortunately there will be no repeat of that in May. The time before that? 1987/88 PSV Eindhoven v Benfica. Before that Ajax v Panathinaikos in 1970/71 which followed Celtic's defeat to Feyenoord the year before. Only four finals without a team from Europe's big four in the history of the competition. Money's changed the game but dominance is nothing new. Anyway, four countries in the semi final is a good thing. If only they were all their domestic champions we might have a tournament worthy of the name. At the moment Barca are playing a game with which we are not familiar. There will be teeth a-gnashing and hands a-wringing in the English media at the lack of semi finalists. Is the party over for the best league in the world? Too soon to tell. But Manchester United are an ageing side with a questionable ability to spend big on renewal. Chelsea are an ageing side with an owner who seems not to want to spend big on renewal. Arsenal are an incomplete side with a manager opposed to spending big on finishing the job. Liverpool aren't even at the races. So it might be a period of uncertain transition. One thing is certain. If England's present period of dominance in the latter stages is coming to an end then two Champion's League trophies since the turn of the century is a poor return. Another Champion's League night and another English team crashes out. Best league in the world or not, it won't be an English club winning the right to lose to Barcelona in Madrid next month. Barcelona. What a team. Lionel Messi. What a player. Think he'd get a decent haircut but he might just win the World Cup for Diego Maradonna's Argentina. Think about that, an addled fatty who gets bitten by his own dog masterminding a World Cup win. That's how good Messi is. But it wasn't always the case. We used to look Barcelona in the eye and laugh, roll our sleeves up and beat the Catalonian fancy dans. And they didn't like it one bit, especially when Hibs beat them 3-2 at Easter Road in 1961. That game features in The Guardian's Joy of Six feature on the Fairs Cup/UEFA Cup. As does Dundee United's famous 1987 win at the Nou Camp (a feat they also managed in 1967). Jim McLean and John Clark. I'll see your Lionel Messi, and I'll raise you a grumpy old man and a fisherman from Fisherrow. With no input from the match official in charge, this would, in fact, contravene one of Fifa's fundamental laws of the game, namely 'the decision of the referee is final'. That was Gordon Smith, the bumbling incompetent atop the SFA slag heap, explaining why there could be no change to the appeals regulations in Scottish football. So let’s not hide behind FIFA rules. Let’s look at our own appeals system and ask ourselves how it can be improved. Let’s admit that referees have a tough job and sometimes need help to make the best decisions. Let’s not have an appeals system in place that relies on referees admitting their mistakes. In this way we will prevent compounding a genuine error on the field of play with another, this time avoidable error, which adds points or suspensions to an innocent player’s disciplinary record. And the author of these words? Rangers, Hearts, the PFA, Celtic, St Mirren, Hibs or any of the other growing band of critics of the way the SFA handles these disciplinary matters? No. In fact that quote is from Neil Doncaster, Gordon Smith’s counterpart at the SPL. So basically the boss of the big league publicly rubbishing the big boss of the game. And proof that Gordon Smith is either unaware of the rules his own organisations is governed by or is prepared to misinterpret those rules to fend off any critics. Time, perhaps, for Mr Smith to be on his way? Many moons ago when I worked in the civil service we discovered that some African republic had a farming law that made a specific expemption for farmers in Northern Ireland. Britain is seen as a model of good governance so younger countries would just lift our laws word for word. So perhaps we’re doing the world a service. Anyone wanting to develop a structure to run football in their country could do worse than look at Scotland and just do exactly the opposite. The SFA was established in 1873. Why have we spent all that time perfecting our imperfections?